One thing that makes us stand out from many other power washing companies is we have a bucket truck that we can utilize for roof cleaning. We have been cleaning roofs for more than 20 years using low pressure. Our proven low pressure roof cleaning system allows us to properly and safely clean you roof to get rid of those ugly black streaks and moss that start to grow after the years. The issue with those ugly black streaks on your roof is that not only do they make your home look ugly and take away from your homes natural curb appeal, it’s also slowly causing damage to your roof! Hiring a professional roof cleaning company can save you thousands from having to prematurely replace your roof based on it’s appearance. 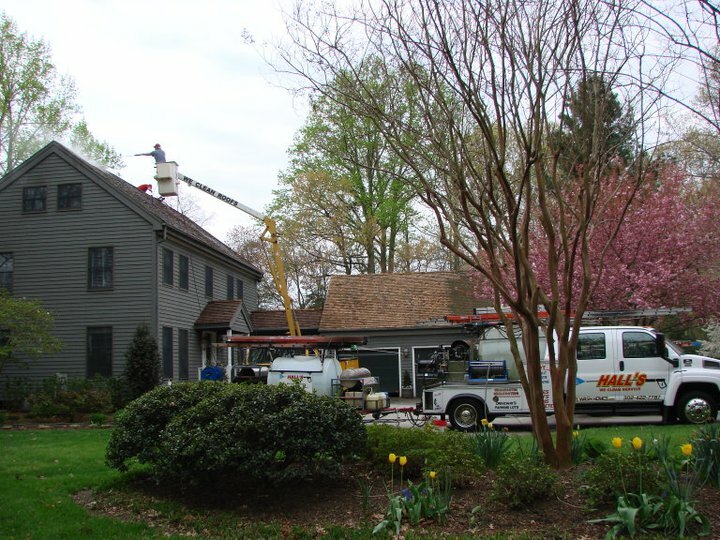 Our low pressure roof cleaning process will make your roof look great. After treatment fungus algae & mold will be killed. May take several weeks for the dead particles to wash away. Don’t let just anyone clean your roof. Hiring someone who doesn’t understand the proper process may damage your roof and cause your roofs life span to shorten, resulting in a for sure roof replacement. Don’t let someone who uses high pressure ever clean your roof, this is a method that will void your warranty! Give us a call today to see how we can turn that ugly roof into a beautiful roof.